Laxmikant Pyarelal's good songs, and there are a few, are not only awesome, they usually also sound uniquely their own; not at all like any of their contemporaries. Listen to 'Aa Jane Jaan', which while bearing all the hallmarks of your average psyched-up westernized Bollywood number (horror effects, organs, unusual percussion, jazzy grooves, crazy intermezzos, screams) really is something else. Lata Mangeshkar sounds amazing... one to rival 'Aaj Ki Raat' for atmosphere, this is a definite favourite of mine. Stunning! 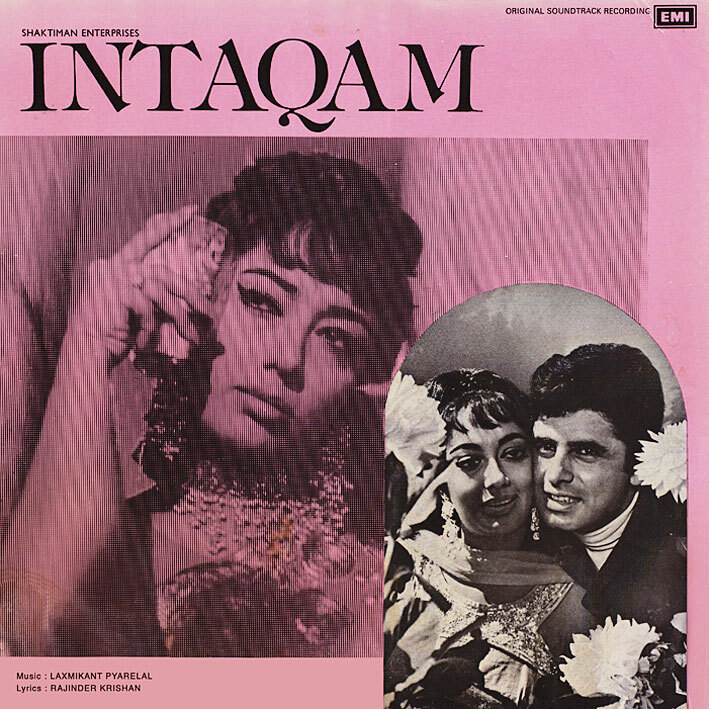 Elsewhere on 'Intaqam'... 'Mehfil Soyee' is pretty cool; lively rock 'n' roll in a Shankar Jaikishan vein. And, how many songs do you know that end with a hiccup? 'Kaise Rahun Chup' does. PS. Couldn't find an appropriate YouTube clip for 'Aa Jane Jaan'... seems to be a famous song though, as I did find this. Wow, that viddyo clip was HORRRRRible. If that's any indication of the new standard for Indian or even for Mumbai music videos, then the art of a classical Bollywood dance and musical number is truly, truly dead, and blogs like yours are the custodians of a rich history that young India seems intent upon forgetting. "Aa Jaane Jaan" is one of Helen's most famous numbers...you can see some of it on Merchant-Ivory's documentary about her "Helen: Queen of the Nautch Girls" which is on some of the DVDs of their films (Bombay Talkies for instance). It's a crazy song and dance!!! Cheers for the hiccup song - there's also some in the booze song from 'Gumnaam'. I love your posts and your rips are high quality! Thanks a million! Could we all expect a great rip for the movie BOBBY (1973) please? Would greatly appreciate that! Thanks alot! I love bollywood songs! Check out this site… it has awesome lyrics from thousands of songs. Could you please reupload this album? You new link seems to have expired - thanks!